We live in a crazy world and gold fever only adds to the madness. The stories we hear of conflict gold from the DR Congo are true, however they are only one half of the story. The other half of the story is the one I am here to explore with Peace Direct partners Centre for Resolution of Conflicts (CRC), whose coordinator is Henri Ladyi. 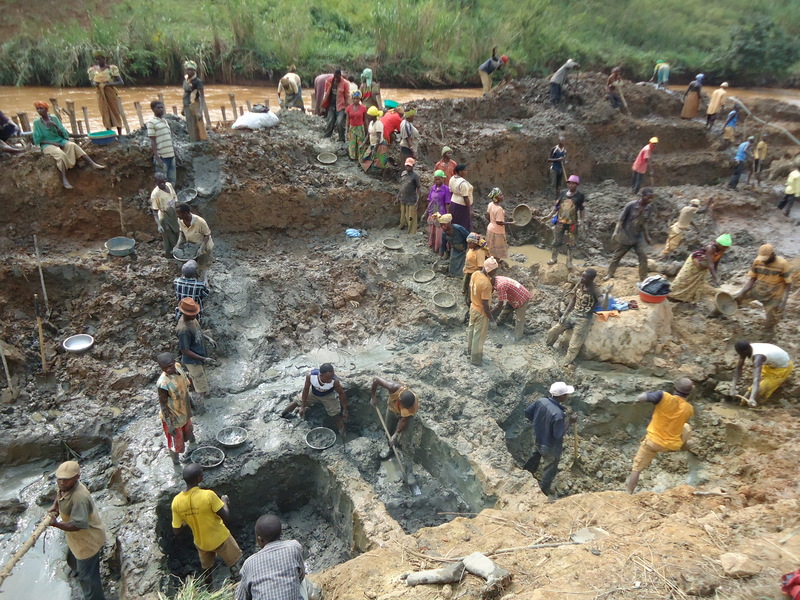 The central conundrum that CRC have identified and want to tackle is, ‘can responsible and well-organised small-scale mining by ex-combatants lead to genuine peaceful and sustainable transformation? I have witnessed elements of this idea in my work in securing traceable gold from Colombia from the Green Gold project in my capacity as Founder of CRED Jewellery. The benefits of which are plain to see now that the certified Fairtrade Gold programme has five certified mining groups in the system. Cred Jewellery alone has paid over $100,000 in FT premiums to their Fairtrade gold partners Sotrami in Peru, since its launch in Feb 2011. To date Sotrami have invested this money in to education in their community as well as the establishing of a food store that supplies at wholesale prices to the wider community. 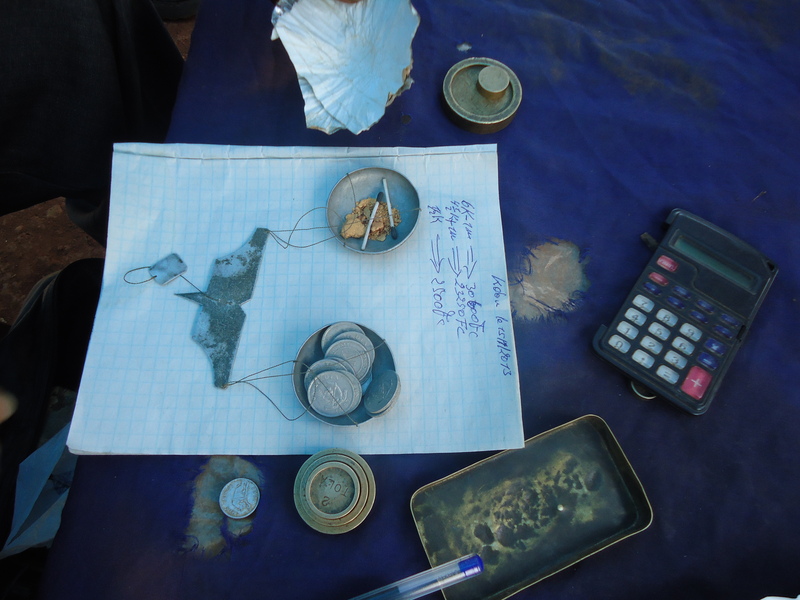 This is the impact that can be made when you get artisanal mining traceable and certified. The small towns of Iga Barrieré and Kobu is where I start my discovery. The road that takes us there snakes north of Bunia, past the new Chinese Gold mining concession and eventually to the highly controversial Anglo Gold Ashanti mine near Mongbwalu. But I am not here to investigate the predictably secretive and un-transparent member of The World Gold Council and Responsible Jewellery Council. I am here to review and understand the very activity of peace building in the war torn DRC. CRC have identified that a key to reducing or deflating the conflict is finding employment for the ex-combatants that inhabit every town and village across the eastern DRC. I admire their boldness as they have chosen to take a pro-active stance towards the issue of conflict minerals. I confess as a veteran campaigner in the jewellery profession for more ethical and fair trade practices, I have arrived with a certain level of unspoken scepticism, but with an open mind. It is hard to describe to someone who has never stood in the artisanal gold fields of Africa what the experience is like. To say it is chaotic is to understate the reality of its cousin horror. It is like stepping into a circle of hell that Dante forgot to write about. Small-scale mining is the second biggest employer on the planet, with a global workforce and dependency in excess of 100 million. They like Dante’s omission are forgotten. The forgotten millions who for the politics of daily bread pound their bodies in the scorching heat in search of the madness that is gold. In Iga Barrieré, on one level everyone is a millionaire and the vast riches of the gold deposits are a living testimony to the resource curse. One story I heard and verified is that in a one-month period the local miners worked with a Korean called ‘Mr Dave’. And they produced 40 kilos of gold using Dave’s mechanised processing unit. Dave of course disappeared back to Korea with the 40 kilo’s without paying, leaving behind a group of defrauded miners and his processing machine. 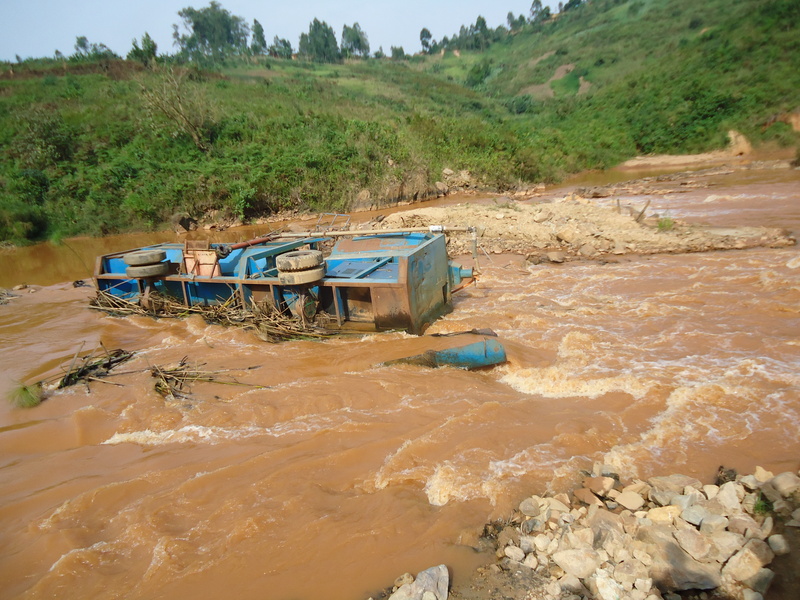 The affected miners showed me the site of Dave’s processing machine, now lying on its side in the middle of the fast flowing Nizi river. A small vignette of how opportunities dissipate through the locals’ finger tips like water through a sieve. The first thing you notice about any small-scale mine site is a constant white noise of mechanised humming of the water pumps and generators. It is a universal sound associated with ASM, but it is soon drowned out by the endless chatter of the trivial pursuits of the countless workers, as they dig and haul pans of soil up though the chain gangs to the top of slopes where the content is panned and washed of its muddy content, leaving only fine sands and alluvial gold particles. All this is backbreaking, dirty, noisy, insecure and dangerous work carried out on the promise of payment plus a daily meal till the gold is delivered. It is mind-boggling how the sheer muscle of humanity, driven on by the primeval urge to survive can move tonnes of earth every hour and in doing so carve vast ravines out hillsides, re-direct river courses, and sculpt entirely new landscapes as they pursue the gold veins wherever they may lead. But to truly understand the ASM sector you need to look beneath the obvious of environmental mismanagement, systemic mercury usage and the child labour issues and understand the hidden driver of money and survival. Small-scale mining next to the Nizi River. During my journey I talked to lots of miners in the towns I visited, on the mine sites I frequented and to the traders I encountered. They all told the same basic story best illustrated by this one miner I spoke to in Kobu. He borrows money from a local trader which will allow him t open up a small pit which requires he employs a group of local diggers, maybe as many as forty a pit. These diggers will move the soil until they hit the gold bearing rock or start to wash the gold from the river sands. If he is digging rock he will also be loaned some mercury that he will use to amalgam the gold from the rock dust. Mercury and gold particles really do like each other. Once he has extracted his gold, he will have to pay back the trader in gold plus the interest he owes which can be as much as between 30 to 50%. He is then obliged by the terms of the original loan to then sell the remaining gold to the same trader at discounted rates on the international fix. This price is determined by weight and purity of gold sold. The trader will determine purity through a process called ‘acid burning’ where the gold is heated and melted to liquid and burned with acid to remove any material that is not gold. After selling the remaining gold he then pays the Government Mining group Kilomoto 30% of his income as they have licensed him to work on their concession in the first place. He then pays his workers for their sweat and muscle. Throughout the time that he opens the pit to the time he finally closes the deal on the gold sale, he has to manage a myriad of different quasi-official interests that are taken in any new mine site. He makes payments to; the Police, the Congolese Security service, soldiers, local government office, local chiefs, the environmental office as well as the hydro carbon tax (he actually offsets his carbon omissions) and anyone else who may have the power to stop him from mining, if he and his partners are left with as much as $3000 between them from a $50,000 transaction for 1 kilo of gold he will feel himself fortunate. When you ask him why he does it he simply replies, ‘It is all I know how to do, and I earn just enough per month to feed my family’. Recycled Gold Jewelry – How ethical is it really? Hi Greg – great posts. I got pointed to you by a blog post that we will be publishing with Marc Choyt at JewelleryNetAsia. Would like to discuss possible blog posts on ethical gold. Happy to follow up by email.